The holiday season comes to the magical worlds of Eternia and Etheria in the He-Man & She-Ra A Christmas Special! When Orko accidentally winds up on Earth during the Christmas winter. He befriends two children after saving their lives. While trying to figure out a way back home, the children tella curious Orko about the nature of the holidays and the good will and cheer that go hand in hand. When they finally return to Eternia, the holiday spirit is spread amongst the entire Royal Palace. Everyone soon rejoices at the idea of celebrating Christmas the same time they honor the nearby birthday's of Princess Adora and her twin brother Prince Adam... also known to us as She-Ra and He-Man! 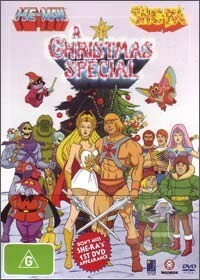 When I was a child, I simply adored the cartoon series She-Ra, especially the crossovers with the He-Man universe and what better way to celebrate this series with the release of the He-Man and She-Ra Christmas Special that once again reunites both universes into a thrilling and exciting adventure. Although not in-depth of the cartoons of today, this series is great for reminiscing the good times when we were children.